Yarn Expert Clara Parkes Joins Knitting Daily TV! A note from Kathleen: The new season of Knitting Daily TV is starting in July and there are big things in store. BIG. Here's producer Anne Bakken to tell you more! Yarn Spotlight: What do you get when you cross a yak with bamboo? (Hint: not a yakaboo!) You get the great yarn characteristics of each combined into one fiber! Set your DVRS, you won't want to miss this. . .
Yarn expert (from Knitter's Review and the author of The Knitter's Book of Yarn) Clara Parkes is joining the cast of Knitting Daily TV, coming this July! Have you ever been so blown away by a skein or ball of yarn at the yarn store that you impulsively made a purchase to later wonder what you'd use it for? Splurged on a luxurious fiber and now are too afraid to knit with it? 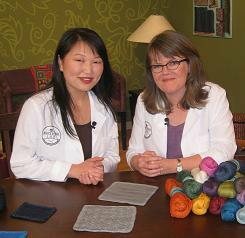 With host Eunny Jang, Clara Parkes demystifies yarn in the newest segment, called Yarn Spotlight. From 100% wool yarns to tweeds, bouclé, embellished yarns, and even bamboo and yak blends, the Yarn Spotlight informs viewers of showcased yarns' characteristics, qualities, and best uses. You'll understand how twist affects a yarn's behavior, what options you have to knit with chain constructed yarns, and even how many plies a yarn has and why. With Clara's help you'll be able to find the perfect project for even the most unique yarns. Yarn Spotlight focuses on a variety of yarns per episode, so you're getting a great insider look at basic to unique yarns each time. You're left feeling a lot smarter about the yarns that are on the shelves and in your stash. For example, you might be the best knitter in the world, with perfect gauge and professional finishing skills, but if you think you're going to be able to intentional drop stitches with bouclé yarn, you should think again! With Eunny and Clara's help, you'll be able to choose a yarn that best fits your designated project-or vice versa. Knowing your medium can make you a true artist or designer. Clara arms you with the education you need to discover your highest potential when designing projects that give the desired effect you're aiming to achieve. The new season of Knitting Daily TV with Clara begins airing this July on Public Television stations across the country, so be sure to check your local listings to see if it airs in your area. If not, don't fret-the entire series will also be available on DVD and by instant download this coming July, too. In the meantime, take advantage of the 3 for $99 Knitting Daily TV DVD sale to stock-up on previous episodes, including the latest Series 800 currently airing today. With one-of-a-kind projects, knitting tips and techniques, and great guest appearance, Knitting Daily TV is how-to television for today's knitter.